This plate forms part of an original set of 24 with the emblems of Isabella d’Este-Gonzaga (1474-1539), wife of Francesco Gonzaga and celebrated Renaissance patron of the arts. The set is painted with mythological scenes, mostly from prints after Ovid’s Metamorphoses, with the exception of two Biblical subjects. The plates include the arms of Gonzaga impaling Este as well as several of Isabella’s imprese (emblems) and devices. Represented is a scene of the young Perseus who, after having slain Medusa, came to the rescue of Andromeda. She had been chained to a rock by the wrathful sea God, Poseidon and subjected to a terrible sea monster. Perseus killed the monster, freed and later married her. 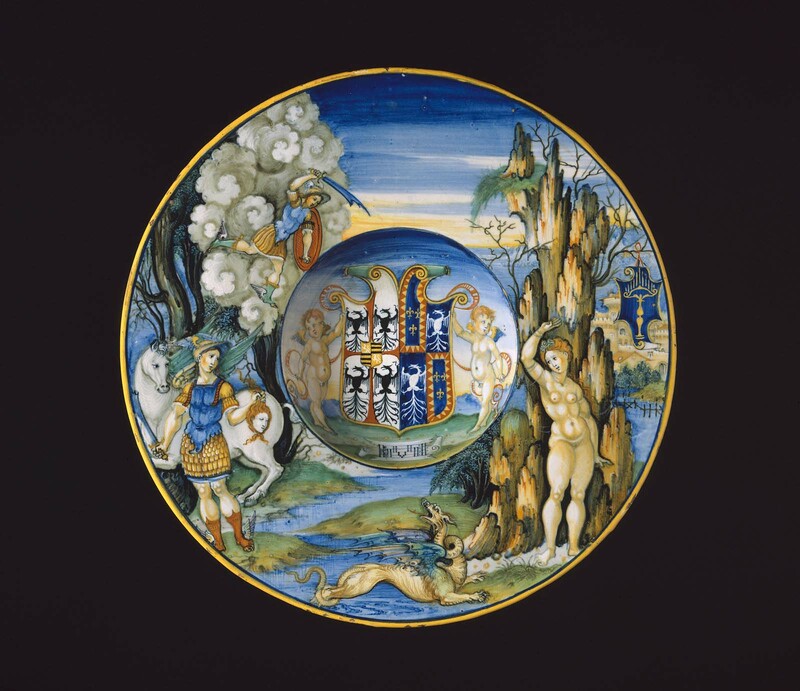 This plate is one of twenty-two surviving pieces of a splendid service made for Isabella d’Este, duchess of Mantua; it bears her coat-of-arms in the center. In spite of being constantly short of money, Isabella was an ambitious patron of the arts with, as she admitted, an “insatiable desire” for ancient Greek and Roman art. Tin-glazed earthenware, known as maiolica, was often decorated during this period with scenes from classical mythology. This plate features the exploits of the mythological Greek hero Perseus who beheaded the snake-haired gorgon Medusa (whose head he holds, at left) and rescued the princess Andromeda, chained to a rock by a monster. The composition is derived from a woodcut in a 1497 edition of Ovid’s Metamorphoses. 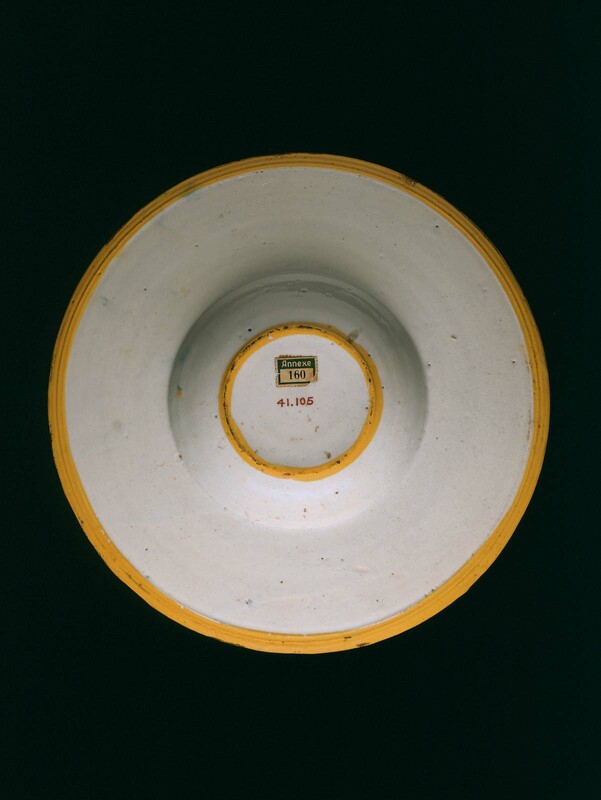 This is one in a service of 21 plates made for Isabella d'Este, wife of Gian Francesco Gonzaga, Marquis of Mantua. See J. V. G. Mallet, "Mantua and Urbino: Gonzaga Patronage of Maiolica," Apollo, September 1981, pp. 162-169 and ibid., "The Gonzaga and Ceramics," in exh. cat. "Splendours of the Gonzaga," ed. David Chambers and Jane Martineau (Victoria and Albert Museum, London, November 4, 1981 - January 31, 1982), pp. 39-43.